It\'s a pity that a PDF reader isn\'t included when Windows 7 is released. However, you can download and install a light-weight yet powerful PDF Viewer to serve as part of the operating system to view, print, and convert PDF. This PDF viewer is free. 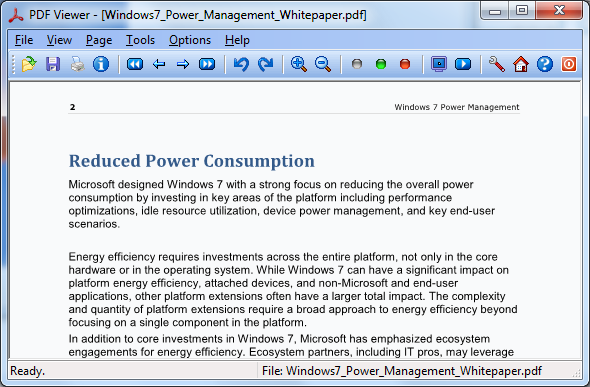 It\'s a pity that a PDF reader isn\'t included when Windows 7 is released. However, you can download and install a light-weight yet powerful PDF Viewer to serve as part of the operating system to view, print, and convert PDF.Features:View and Print PDFOpen, view, read, and print Adobe PDF files of all versions.Zoom in and Zoom out to any sizeSupport zoom-in and zoom-out PDF pages to any PDF page to any size of your choiceRotate PDF page clockwise and anticlockwisePDF page can be viewed in different angles thanks to the fast rotation algorithm.Free PanningDrag your mouse up and down, or press your up arrow key and down arrow key to pan view a PDF file.Work with 86 different languagesPDF files with Asian, Hebrew, Arabic et al fonts can be opened and viewed without difficulty.Slide show PDF document in full screen modePDF document can be viewed in slide show and/or in full screen mode.Extract text and images from PDF filesText and images in PDF document can be extracted and saved to the location of your preferences. Unlike some other free PDF reader, this feature available in our PDF Viewer is totally free!Light-Weight PDF ReaderPDF Viewer is a light-weight PDF reader, only 927KB in size. Small, speedy, and powerful! Flower frames - widget photo frame. New widget - from photofuneditor.com. New photo frames with flowers on your desktop. Photo of a loved one, decorated with roses, tulips, daisies. Drag the widget on your desktop to any place. Publish Web albums with the free edition of the Master Album Maker. A batch wizard lets you add multiple images to an album in just one operation. Resize, rotate and crop images, adjust image composition, add text captions and background audio. STDU Viewer is a document viewer for multiple file formats. The goal of this software is to replace the multiple document viewers with a single simple application. STDU Viewer supports following document formats: DjVu, TIFF, PDF.